Celestite, also known as Celestine, is revered for its high frequency and Divine energies, and is known as a powerful healing crystal. Celestite has been called a “teacher for the New Age", as it will connect one with the Angelic realms, allowing for the free-flow of these higher frequencies into the Crown and Third-Eye Chakras, and also down into the Throat Chakra for expression. Bringing mental calm and clarity in the midst of any chaotic circumstance, Celestite can allow one to easily flow through a traumatic period and still come out on top. Physically, Celestite sends energy to the organs of the higher chakras, aiding the healing of disorders such as brain imbalances, cellular disorders, and ailments of eyes, ears, nose, and throat. Celestite can also act as a detoxifier and pain reliever. 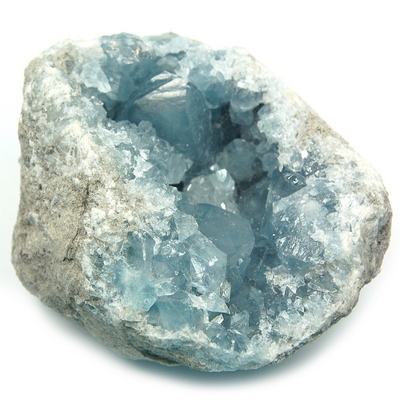 Please note that Celestite is very fragile, and should be handled carefully. Do not keep these clusters in direct sunlight, as their color will fade. Recharge Celestite by wrapping the stone in a soft blue cloth and setting it in a drawer or box for up to two days. Click here to see Celestite in our online catalog.